McCain's widow, Cindy McCain, tweeted on Tuesday her congratulations and support for Kyl. 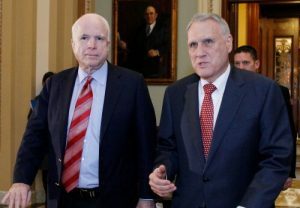 "John Kyl is a dear friend of mine and John’s," Cindy McCain tweeted. "It’s a great tribute to John that he is prepared to go back into public service to help the state of Arizona." Ducey, responding to Cindy McCain on Twitter, said he is "deeply grateful to Senator Kyl for agreeing to succeed his friend and colleague of so many years." Ducey confirmed the appointment during a news conference on Tuesday. Kyl served in the Senate from 1995 to 2013, representing Arizona. He decided not to run for reelection in 2012 and was succeeded by Sen. Jeff Flake (R.). From 2007 until he left the Senate in 2013, he was the Senate minority whip. In 2020, a special election will be held to determine who will hold the remainder–another two years–of what would have been McCain's term. The seat will then be on the ballot again in 2022. State law prescribes how a vacant seat in Congress is filled after a death, resignation or expulsion. Cindy McCain and daughter Meghan McCain were both rumored to be potential candidates to fill the vacant seat. Kyl's appointment to the Senate will restore the 51-49 majority held by Republicans.